Kichler always delivers a quality product! This is a nice goes in most bedrooms type of fixture. It didn’t have to be assembled which is a plus. Most lights that look this great at this price point require tedious assembly! This Armstrong collection 2-light wall sconce features a natural brass finish that will complement many contemporary and modern decors. Clean lines of the steel frame add interest while the exposed bulbs provide ample light completing this unique design. This Mid-Century wall sconce in natural brass from the Armstrong collection features a "sputnik" design with adjustable arms allowing you to customize the light for just the right look. Dimensions: 5 inches high x 16.75 inches wide x 4.25 inches deep. Turn on our fixtures, and watch your room transform even more. From lighting to ceiling fans Kichler collections are built around our simple philosophy of bringing you the effect you want for your home or business. Our collections coordinate from room-to-room, or let you mix and match from wall-to-ceiling. And each fixture is designed to deliver a stunning quality of light that makes your space more beautiful and more livable. As one of the largest, privately held residential lighting fixture companies in North America, we're constantly working to create innovative and on-trend decorative products as well as knowledgeable support. Since 1938, we've been creating products that are not only well designed, but also practical. We invest millions of dollars each year in design, technology and testing to assure that we're offering distributors, designers, installers and homeowners not only innovative technologies - but also fixtures that perform efficiently, install intuitively and deliver a premium source of light. This philosophy holds true for everything we create - from our wide variety of decorative fixtures to our award-winning landscape lighting to our ceiling fans. Great price for these lights! 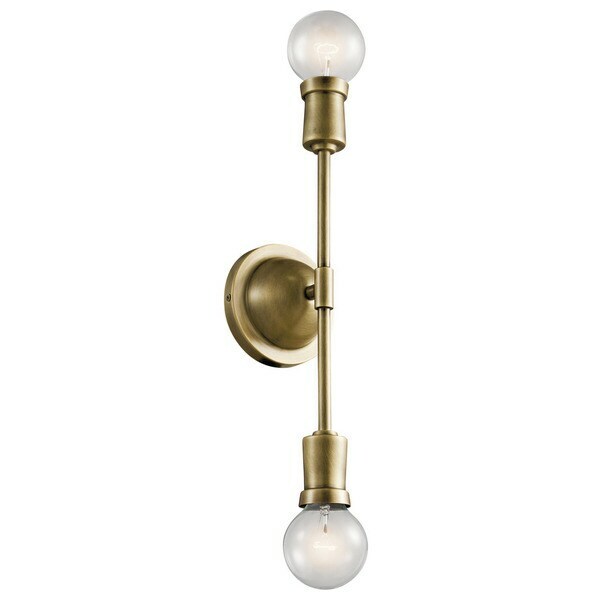 Was on the hunt for simple brass sconces with 2 lights. These fit the bill and are beautiful installed. Would get again! This is the second Kichler piece from this collection that we've purchased from Overstock. We bought this one to replace an outdated fixture in our attic stairwell and it couldn't be a better upgrade! I don't have anything but good things to say about it! It arrived quickly and safely and was a breeze to install! Highly recommend! I love it and it is exactly as described. Just note that it does not include light bulbs. These are gorgeous. 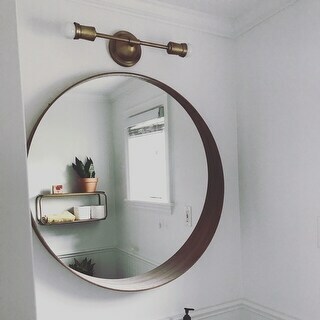 Excited to install one on either side of a large, round brass mirror. Using unique, gem shaped LED bulbs for a modern touch! These are in my entry way and look amazing! "How big is the circle in the middle where you connect the electricity?" "can this fixture be hung horizontally as well as vertically?" Yes,this can be hung horizontally.